The mathematics of the First World War period are truly staggering. "Some of our Bands of Ringers have been hard hit, by not enough left to ring the bells for services, until more recruits had been called in and taught to handle a rope. We believe Stone Parish Church was the worst to suffer, Mr George Sheppard being left without one member". The 1921 report gives the names of 59 G & B members who lost their lives in the war with the greatest number from the Wotton Branch. 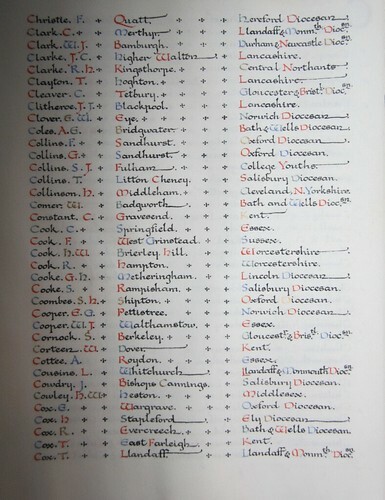 It lists 18 Wotton Branch members who lost their lives. Another report of the period mentions the Association's plans to honour the dead by augmenting one of the towers in the middle of the association. One possible plan was the augmentation of Stonehouse to 8 but eventually, the augmentation of Berkeley to 10 was selected. It is appropriate it was a Wotton Branch tower chosen as it was this Branch which suffered the most causalities. Half of the cost of the two trebles was donated by two anonymous benefactors from Berkeley. 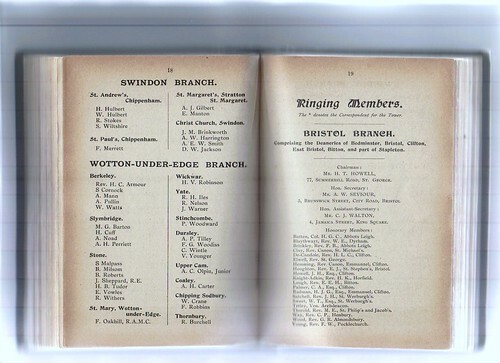 The Gloucester & Bristol 1916 Report with the names of all the Wotton Branch members serving in H. M. Forces. 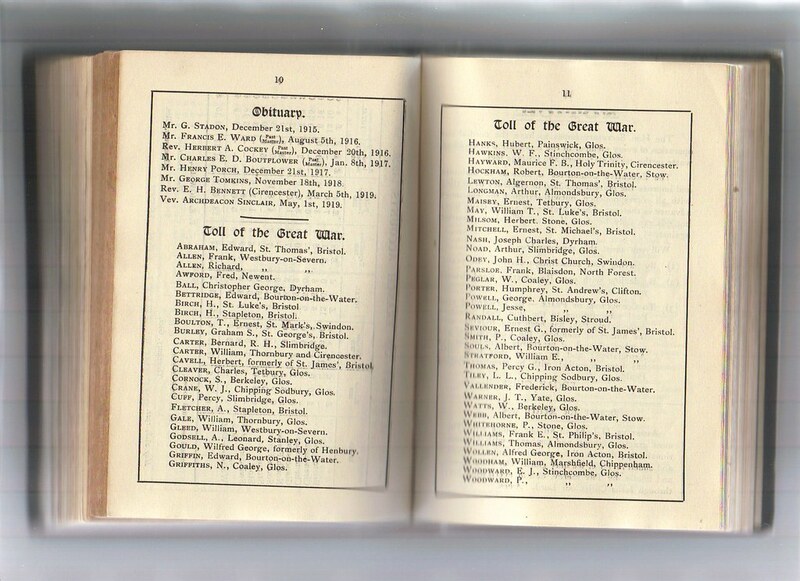 The Gloucester & Bristol Annual Report for 1921 with names and towers of those who dead on active service or who died because of wounds after the war. The Rolls of Honour kept at St. Paul's Cathedral, London. "They whom this book commemorates were numbered among those, who, at the call of King and Country, left all that was dear to them, endured hardness, faced danger, and finally passed out of the sight of men by the path of duty and self sacrifice, giving up their own lives that others might live in freedom. "Following the Name of each man will be found that of the Parish or Township in which he gave most of his service as a Church Bell-Ringer previous to joining the Forces, and also that of the Society, Guild, or Association to which he more especially belonged." Alan would much appreciate it if ringers at all towers would check whether any former members are commemorated on peal boards or special memorials, in minute books or other documents that their tower may hold. The statement at the 1929 meeting that "this book had been brought up to date" may refer to the addition of names at the ends of some existing pages, which consequently are not in alphabetical sequence. It is believed that these names brought the total number to 1077 as can be seen today in the Book itself and also shown on this website as the Main List. The "supplement" mentioned in the minutes of the 2005 meeting presumably refers to the Second Addendum, which contains the names of 20 ringers from Kent. "The Council naturally wished to honour the memory of ringers who had been killed during the war, so in 1919 a start was made on collecting their names from the Associations. "When the Council met in Northampton in 1920, the members stood in their places at noon as the names of nearly a thousand ringers were read out to the sound of tolling of bells in the neighbourhood; this took nearly half an hour. "During the 1921 London meeting, the members went from Church House across to Westminster Abbey, and held a brief service round the tomb of the Unknown Soldier. The President laid on the tomb a wreath with the inscription, " A token of deep respect from the Church Bell Ringers of England." A course of Stedman Caters was then rung on handbells. "In 1922 it was suggested that this Roll of Honour of ringers who had fallen in the war be preserved in a more permanent form, and the Librarian, Rev. C.W.O. Jenkyn, who had served as Chaplain to the forces on the Western Front, was empowered to make enquiries as to the cost of this. Jenkyn immediately set about trying to ensure that the list was as complete and accurate as possible, by applying to Association Secretaries for details. As usual, the response was very varied, but eventually he had collected nearly 1,100 names, and made enquiries as to the best way of preparing a permanent record. The sum of £20 was voted from the Council's funds to get the work done. The result was a beautifully written and illuminated volume, the work of Albert Cousins, a professional writer from Cambridge; it was said by an art expert from South Kensington to be "the most beautiful example of modern writing and illumination which had ever come into the museum." The book was placed in the library of St. Paul's Cathedral for safe keeping." "The President then intimated that as the Treaty of Peace was not officially signed, and the roll of honour of fallen ringers was as yet far from complete, it was proposed to defer the reading of it until a later occasion." "The President then announced that he had received the Roll of Honour of all save three of the affiliated Guilds and Associations, and that he would commence reading the combined roll at noon precisely." "The discussion of the foregoing subject was interrupted at noon by the reading of the Roll of Honour, all the members rising in their places. The roll contained about 950 names, the reading of which occupied the President for 25 minutes. Bells in some of the churches were tolled for a short space at the commencement and the President recited brief prayers at the end." "It was proposed by the Rev. Canon H. J. Elsee, and seconded by Mr. J. H. Griffin, that the librarian be asked to ascertain the cost of engrossing on parchment, the names of ringers who fell in the war and that he report the same to the Council.- This was carried." "The Honorary Librarian then gave a statement in respect to the "Roll of Honour," with which he had been instructed to proceed. He reported that he had written to the various secretaries, and the names for the roll now numbered about 1,100. It was for the Council to give him further instructions in the matter. After many suggestions and some discussion, it was resolved, on a motion, proposed by Mr. T. Hervey Beams, and seconded by Alderman J. S. Pritchett, that the wording of the "King's Scroll" should be adopted as the preface, and that the names should be written in alphabetical order, followed in each case by the name of the tower and association with which the ringer had been specially connected - abbreviated where possible - and that the roll should conclude with the text, "Their name liveth for evermore." It was not considered essential that more than the title page should be illuminated, but that the writing should be good and of a permanent character. "It was also agreed that the roll should be bound in the best leather, and the Standing Committee, having already suggested the payment of £20, this sum, together with the whole proposal, was, on the motion of the President, carried, nem. con., and all details left in the honorary librarian's hands." "The President voiced for the Council how deeply they were indebted to the honorary librarian for all he had done in compiling the roll. It was undoubtedly one of the most beautiful modern examples of its kind of work. The Honorary Librarian then moved that the Memorial Book be placed in the Library at St. Paul's Cathedral, London (the Dean having kindly consented). This having been seconded by Canon Baker, it was unanimously agreed that it be deposited for inspection and on permanent loan, and to be produced to the Council upon demand of the officers; with this, a proposition of Mr. W. A. Cave's, seconded by the Rev. C. E. Matthews, was also agreed, that it be placed on the table at the annual meetings." "ROLL OF HONOUR -- The Hon. Secretary stated that this book had been brought up to date (as they would observe)".